There are such things as bad movies, especially in this day and age. Some movie studios are so desperate for box office success that they’ll pour money into promotion and star power, but leave the actual development of the movie last on their to-do list. The result can be rushed, dragged in pacing, horribly acted, and working on nothing but half-baked characters or ridiculous ideas. This type of letdown can disappoint or even anger certain viewers, especially if the film is part of a reboot of a beloved franchise (that did not end on the highest of notes). So to all of the moviegoers who adored the action-packed, imaginative, and all around fun of Sam Raimi’s original films about your friendly neighborhood Spider-Man, prepare for a rather stinging slap in the face. “The Amazing Spider-Man 2,” the 2nd film in Sony Pictures’ revival of the Spider-Man franchise, is so silly and ridiculous in all the wrong ways that Peter Parker with an emo haircut dancing to jazz in a bar may be sorely missed on the viewer’s part. Peter Parker (Andrew Garfield) is graduating high school, madly in love with Gwen Stacy (Emma Stone), and is praised by New York City for his crime-fighting work as Spider-Man. One person who gives the web slinger a disturbing amount of fanfare is Max Dillon (Jamie Foxx), an electrical expert at Oscorp who is nearly invisible to everyone around him. When he is killed in an unfortunate (and, to be honest, ridiculously silly) accident, he gains the power to harness electricity and begins to terrorize a city that shunned him under the name Electro. On top of that, Peter deals with the return of his old childhood friend Harry Osborn (Dane DeHaan) and has concerns for the safety of his girlfriend. Soon, Peter realizes that Oscorp may have more to do with him and his dead parents than he thought and risk the safety of the ones he loves to stop the evil forces at his door. What’s truly amazing about “Amazing Spider-Man 2” is its ability to be totally rushed in its 142 minute length, but also how it drags on and on with little to no excitement whatsoever. Spider-Man himself only appears in the film about 7-8 times in nearly two and a half hours, while light is attempted to be shed on Peter and Gwen’s relationship, Electro’s back story, Harry’s back story, Peter’s life at home with his Aunt May (the always delightful Sally Field), and Peter’s investigation of his father’s science. The film is overstuffed with plot and characters that have scenes cut short or end up pointless. Accompanying these rushed scenes is awfully cheesy dialogue (which apparently needed 3 writers to be this groan-inducing) and annoyingly fast editing. The acting can be horrible too, mainly from Paul Giamatti’s cartoony accent as Russian mobster turned robo-rhino Aleksei Sytsevich (thankfully, his screen time is short). Mr. Foxx has the right character as the obsessive fan scorned, but he just doesn’t feel right for the part on-screen, especially when he turns blue and dons a rubber outfit Batman would probably sue him for. DeHaan’s most famous role to date is his turn as the paranoid, emotionally unstable Andrew from 2012’s exceptional “Chronicle.” He basically has half of that character here along with a somewhat enjoyable hammy villain character, until he turns into the Green Goblin, who looks like The Grinch. To the film’s credit, it’s male and female leads still have the spark that worked in the previous installment. Peter and Gwen have great chemistry, playing off each other and acting speechless around their own adorableness. It’s easy to see why Stone and Garfield are a couple in real life, because they have a spark that puts a smile on the face of any romantic. The special effects are also pretty impressive, with great shots of Spider-Man swinging around the city and pulling of aerial stunts against bad guys. Clearly this is where most of the money went (along with the constant product placement of Sony technology). But still, the little good cannot help the monstrous bad in this sour superhero sequel. Serious scenes are either too ridiculous to take seriously or just fall flat entirely. The suspension of disbelief is stretched to baffling proportions and the laws of science are scoffed at throughout the movie. The silliness in “Amazing Spider-Man 2” rivals that of the equally disastrous “Batman & Robin.” At least the latter film can be enjoyed while pointing out its stupidity. Here, Spider-Man just disappoints nearly scene after scene with little to no fun, no suspense, and barely any investment in most of the characters. There are also moments the comic book nerds will not be too pleased about, but I’m sure the disappointment of Marvel fans means little to the filmmakers here. With 2 more films on the way, let’s hope Spider-Man learns to care as much about the audience as we do about his returns to the big screen. Until that great responsibility is taken seriously, avoid this movie at all costs. 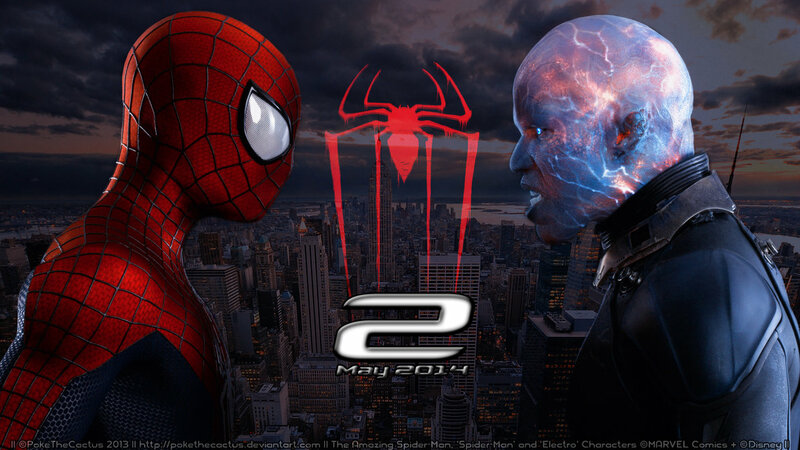 This entry was posted in Uncategorized and tagged Amazing Spider-Man 2, movie review. Bookmark the permalink.